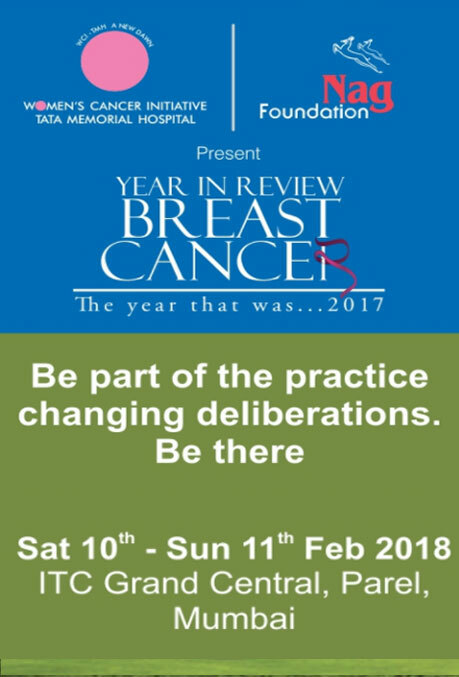 Women's Cancer Initiative - Tata Memorial Hospital and Nag Foundation Invites you for the "4th edition of Year in Review: Breast Cancer Conference". This conference will be held on Sat 19th Jan - Sun 20th	Jan 2019, at Hotel ITC Grand Central, Parel, Mumbai. Breast cancer is not so much a disease as a universe - endlessly complex, huge and continuously evolving. Every year a large number of clinical, translational and basic studies are presented at many conferences, at least some of which have an impact on practice. 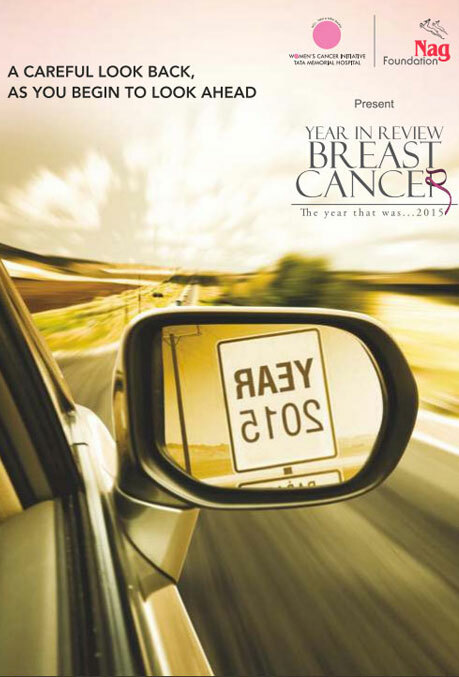 It is becoming increasingly difficult for even specialized oncologists to keep pace with this explosion. Number of meetings in Best of format now try to make this information digestible to practicing clinicians. In the above sessions, we intend to cover surgical, radiation, medical, pathology, biomarkers and imaging issues making this meeting a truly multi-disciplinary one. At the end of every session there will be rapid review presentation on additional abstracts. The selection of abstracts is based on originality, innovation and potential impact on clinical practice. 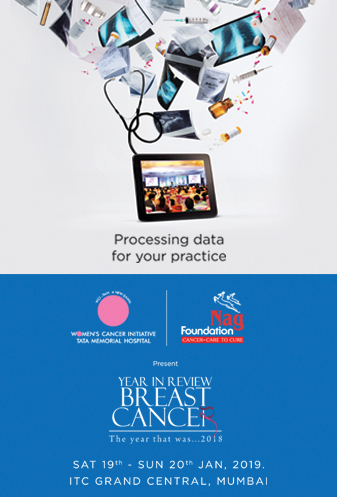 We believe that presentation of the most impactful and important abstracts from all important conferences in the preceding year will give the participants a feel of the landscape of breast cancer research, especially that impacts practice. We hope to benefit from your partnership and wisdom in initiating, undertaking and nurturing this idea. Dr. Rugo is the Director of the Breast Oncology Clinical Trials Program, and is the principal investigator of multiple clinical trials focusing on combining novel targeted therapeutics with standard treatment to improve the treatment of both early and late stage breast cancer. In addition, Dr. Rugo is working on studies to evaluate cognitive function in women receiving chemotherapy for breast cancer, as well as novel ways to reduce toxicity from therapy. Dr. Rugo has established collaborations with a number of other large academic medical centers for the purpose of expanding the novel therapies that are available for our patients, including herbal agents that appear to have an antitumor effect in the laboratory. She is an active member of the national cooperative group, CALGB, and she is a founding member of the Breast Cancer Research Consortium, as well as serving as an investigator in the UCSF Breast SPORE (the Bay Area Specialized Program of Research Excellence in Breast Cancer). Dr. Rugo teaches medical students, physicians and regularly lectures locally, nationally and internationally on subjects relating to the treatment of breast cancer. At UCSF, Dr. Rugo runs the Breast Forum, an open bimonthly evening educational session for breast cancer patients, families and friends from throughout the bay area. Dr. Shaheenah Dawood is the Head of Medical Oncology and the Head of the Breast Cancer Program at Dubai Hospital in the United Arab Emirates. Dr. Dawood completed her M.B.B.Ch at Dubai Medical College in 1998 and a Master of Public Health degree at the Harvard School of Public Health, Boston, USA in 2008. Her postgraduate medical training programs include a Fellowship at McGill University in Canada in 2006, and the Susan Komen Breast Cancer Fellowship at the University of Texas M.D. Anderson Cancer Center in 2007. Dr. Dawood is a member of various professional organizations, including the American Society of Clinical Oncology (ASCO), the American Association of Cancer Research (AACR), the Canadian Association of Medical Oncologists, the Emirates Medical Association, and the Inflammatory Breast Cancer Research Group. She is also the co-director of the Middle East Research Network. Dr. Dawood has been a primary author or collaborator on over 50 peer-reviewed publications in national and international journals. In addition, she has collaborated with other authors to write a number of book chapters. 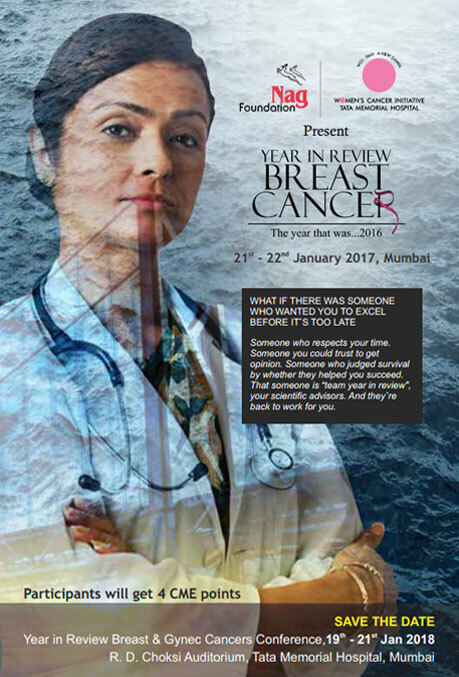 Dr. Dawood has also been involved as a journal reviewer and as an editorial consultant for many cancer-related journals. Research Interests:Dr. Dawood’s researcher interests encompass Triple Negative Breast Cancer, Inflammatory Breast Cancer, Metastases, as well as life-style issues and survival outcome of cancer patients. Dr. Modi graduated from University of Alberta Faculty of Medicine & Dentistry in 1995 and has been in practice for 14 years. She completed a residency at Memorial Sloan Kettering Cancer Center. Dr. Modi also specializes in Internal Medicine. She currently practices at Memorial Sloan Kettering and is affiliated with Memorial Sloan-Kettering Cancer Center. Dr. Modi accepts multiple insurance plans including Aetna, MVP Health Plan and Medicare. Dr. Modi also practices at Memorial Sloan Kettering Cancer Center in New York, NY. We will get back soon......!